The American Sugar Alliance took a literal approach in a recent digital advertising campaign to depict Mexico dumping subsidized sugar on the U.S. market. But in the world of international trade law, the term “dumping” means more than simply flooding a market with too much of something. Dumping refers to a) selling a product cheaper abroad than at home, or b) selling a product for less than its production cost. Either way, if a foreign country is dumping, it’s choosing to make less money from the sale of the dumped product. So, how can an industry afford to dump? Sometimes subsidies are at play. And by dumping its surplus into a foreign market, an exporting country can maintain domestic prices at a higher, more profitable level for domestic producers. In 2015, the U.S. government found Mexico guilty of both dumping and subsidization, noting that antidumping and countervailing duties of 80% would be needed to level the playing field. But Mexico entered into an agreement with the U.S. government to avoid those duties and said it would end its unfair trading practices and abide by U.S. trade laws. It didn’t. How do we know? Just look at the price sugar fetches in Mexico compared to the United States over the past year. 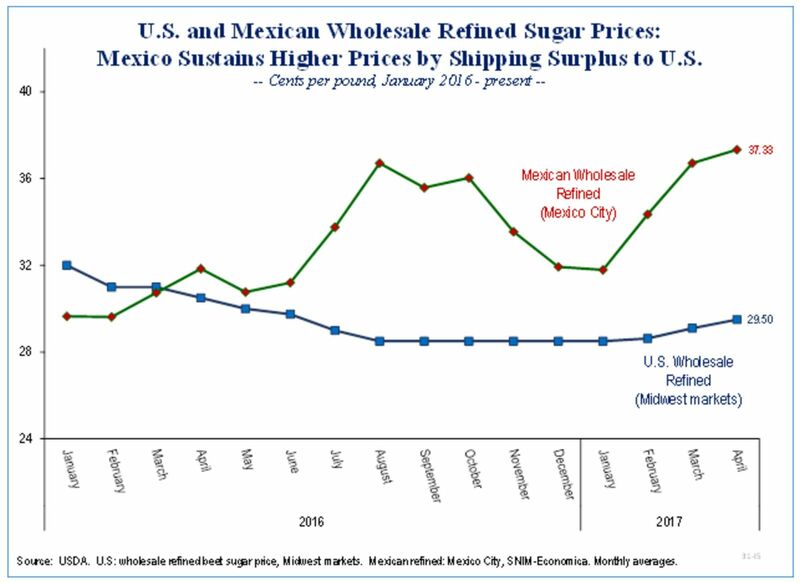 And the Mexican price does not include the cost of transporting the sugar north, meaning the actual dumping margin is even higher than the price spread. Mexico’s trade abuses are wreaking havoc on the U.S. market, costing U.S. producers $4 billion and many sugar workers their jobs. The time has come to hold Mexico accountable.